Today we’re talkin’ In-display Ads! At Veeroll we obviously LOVE the power of a good in-stream ad, especially when it’s running to a list of highly targeted placements. 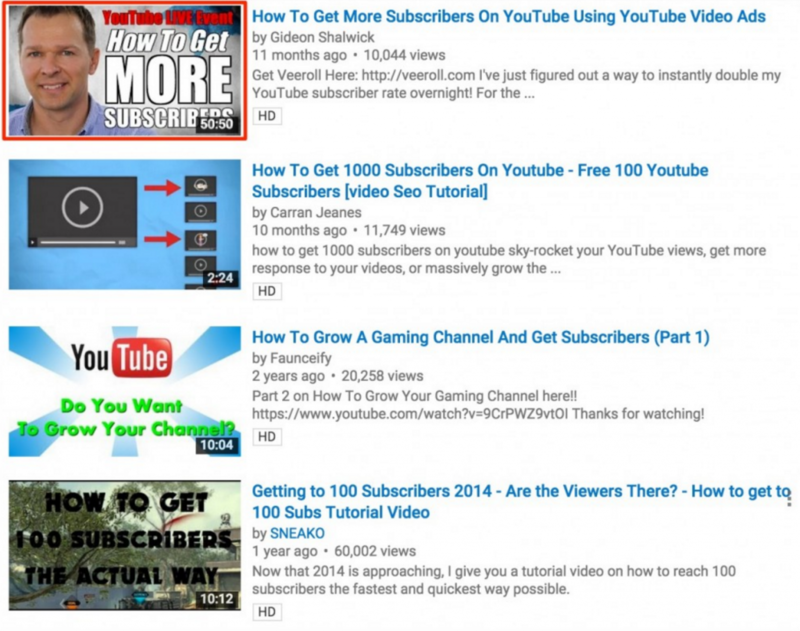 But…there’s more under the sun when it comes to Youtube Video Ads! In fact, in-stream ads are not an only child. They are part of an actual family of ads called: Trueview. In-stream’s sibling is called: in-display. And yes, this too is one heck of a powerful way to use video advertising! Today I will tell you more about what in-display ads are and why you should be using them. If, after this introductory post you are longing for more, we’ve got you covered. This Thursday (October 22) at 7 PM – EDT we’re running a very special, members-only webinar with AdWords expert Tom Breeze, in which he will share all his in-display tips and strategies. If you’re a member, make sure to check your email for all the details on where it’s at, or sign up for Veeroll now to join the club and get access! For now, let’s get started with the basics. An in-display ad is a YouTube video ad format that appears in search results, related videos, watch pages and Google Display Network sites as a thumbnail image and promotional text. For more examples, check the quick video I made for you at the top of this post! The idea of the Trueview ads family in general is to allow the viewer to exercise their right of choice. In Google’s Youtube Trueview Playbook it says that people who choose to watch an ad are 75% more engaged than those who are forced to do so. In the case of in-display, this concept of “choice” is even more important than with in-stream ads. Because your ad will not actually run in front of another video. It will just be “subtly” sitting there in the sidebar, trying to seduce people to click on it. But if they don’t click, you don’t pay. Simple! If they do, they will land on either your channel page or the watch page of your video. And from there you can choose to send them pretty much anywhere. Why should you use In-display Ads? They are easy to get approved. When people click on your ad, they will be taken to your channel or the watch page, not to a landing page. This means that the typical, and fairly strict, Adwords landing page requirements don’t apply. Of course, you do still have to comply with the general Youtube community guidelines. They are flexible. Once someone is on your watch page, you can send them to any link you want from the description box under your video, including affiliate links. Of course, you can also use annotations in your video to send them to your own website. They are easy to scale. This is something you’ll learn more about on Thursday’s webinar, but in-display ads work well with keyword targeting. With keyword targeting, you can more easily reach a bigger audience, vs. when you target placements (unique video links). Of course, it depends on your campaign goals which targeting method is best, but if you want to go for “reach” then in-display ads are a great option. They generally convert well, because when someone has consciously made a choice to watch your ad (meaning they clicked on the thumbnail) they are much more willing to take the next step and sign up for whatever your amazing offer is. Below I will give you 5 quick tips to get your brain in the right frame of mind for your first Youtube in-display video ad campaign. As always before you get crackin’, it’s good to think about the overall goal of your campaign. Do you want to promote an offer, gain subscribers or simply get engagement on your video? Write down what your goals are so that you can decide where to send your viewer to (the channel or watch page) and what you want them to do after that. For in-display ads, we recommend to use keyword targeting. If you’re a Veeroll member you now have access to our brand new keyword targeting tool. This allows you to quickly create a list of correctly formatted keywords for your campaign. To find out which keywords to target, it helps to dive into your viewers’ mind for a second. What keywords do you think they’re typing into the search box? How does your product or offer relate to the solution they’re looking for at that moment? When people are browsing on Youtube they are generally looking for inspiring, entertaining or educational content. Therefore it’s good to think about how your video ad can deliver value that feels “native” to the Youtube experience. When people click on a video in the sidebar they don’t necessarily expect it to be ad-like, they are likely looking for valuable content. Do you have a channel with tutorials for example? Then it can be a good idea to use one of those tutorial videos as an in-display ad. Or, you can create a new quick 1 min. video with tips and invite them to watch the rest on your website. It’s even more important with in-display ads to focus on giving value right away. Then, after they’ve watched your video you can easily retarget them later with an in-stream ad, for example. The sky’s the limit, especially when it comes to remarketing and integrating both ad types, but more on that later! The one thing that is incredibly important when it comes to in-display ads is your thumbnail! Because, if it doesn’t look awesome, trustworthy and interesting… nobody is going to click on it. “I think I’m going to browse the internet and click on some ads today!” – said no one, ever. Generally, people aren’t browsing the internet with the intention of clicking on ads. They’re looking for content. So, you have to make sure that your thumbnail convinces them that it’s worth taking a look at (even though it shows a little yellow label next to your video that says “ad”). Use an image of your face! Adding a personal touch can help to create trust. Add some text on top of the image, that makes it very clear what your video is about. Make sure the image+text are representative of the content of the video, and not misleading. Otherwise, you will just annoy people and will be paying for useless clicks. Make use of contrast and bright colors that stand out. Consider how your thumbnail comes across in different sizes, as it totally depends on each device how big the thumbnail will be displayed. See how Gideon’s thumbnail stands out compared to the rest? There are some great free tools online you can use if you’re not a Photoshop whizzkid. Canva is the one we love the most, as it’s super easy to quickly create designs, upload photos and add text. Next to your thumbnail, you also get a tiny bit of text, that you can use to describe your video in more detail. It can be tempting to rush through this part, as it’s usually your last step… but we recommend you to really take time for these 1 or 2 lines of text. ONE effective line of text can totally make the difference! 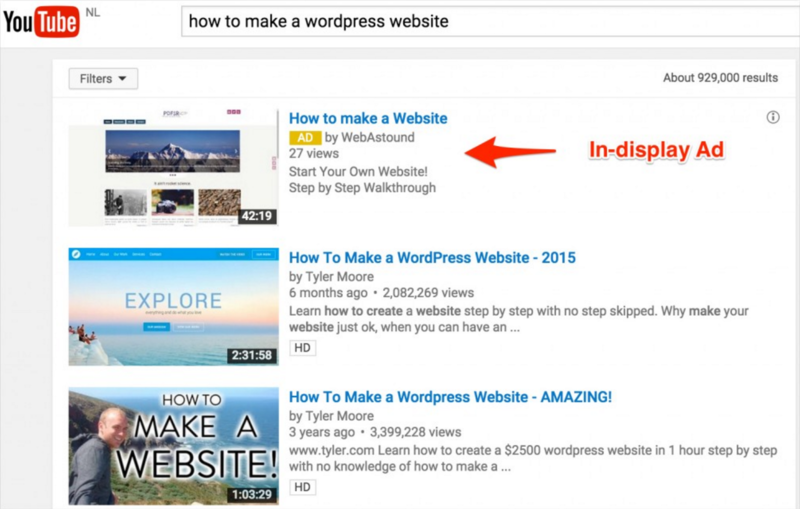 If you struggle with copywriting, it can be helpful to just browse around Youtube yourself and see what examples you can find. If you see an ad you like, just copy the description to a Google Doc / Evernote or an old school notepad and see how you can tweak it for your own specific ad! Alright, these are the basic elements you should take into account before starting your own in-display campaign! Of course in the webinar, Tom Breeze will go a lot more into depth. After that, we’ll start running some of our own tests as well, on which we will report back to you later. Got Q’s? Feel free to ask them below. In case I don’t know the answer I will make sure to pass it on to Gideon and Tom for the webinar! I will also be joining in the chat tomorrow, so I hope to “see” you there!